The Wahoo ELEMNT and ELEMNT Bolt are standalone GPS units that are configured by a companion app on your iPhone or Android device. 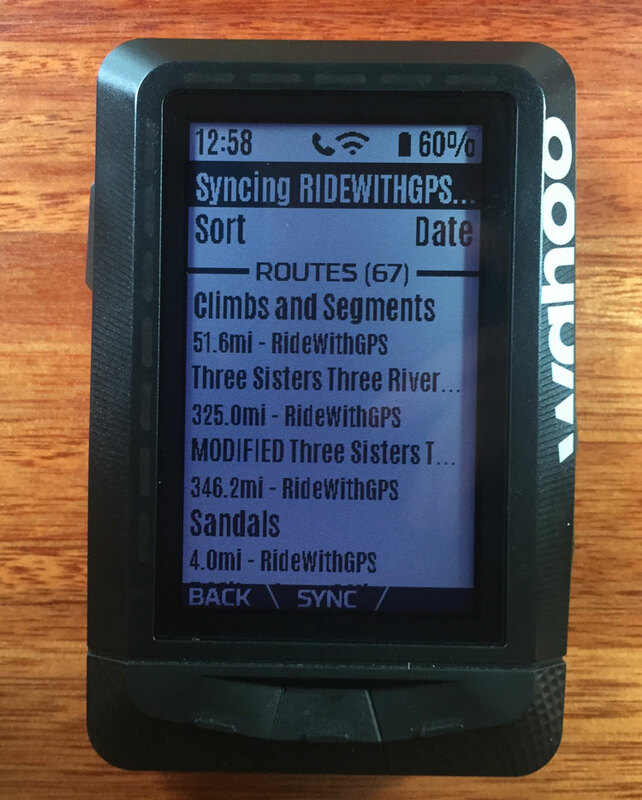 You can also configure ELEMNT and Bolt to connect to a wifi network to sync routes that you have created on ridewithgps.com and navigate these routes on your device. This companion app and authorization steps also apply to the ELEMNT Bolt GPS. 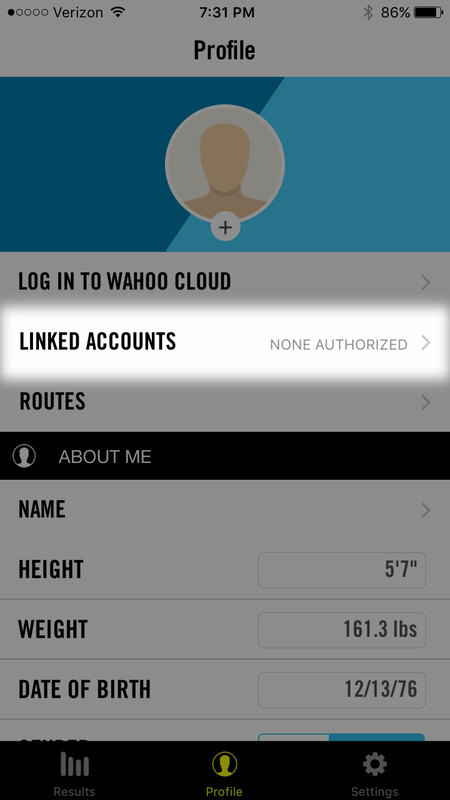 To use the Wahoo ELEMNT and routes from your Ride with GPS account, you’ll first need to pair the ELEMNT with the Wahoo ELEMNT companion app. If you created your Ride with GPS account using the sign up with Facebook option, then you must follow these directions to change your account settings to include an email address. 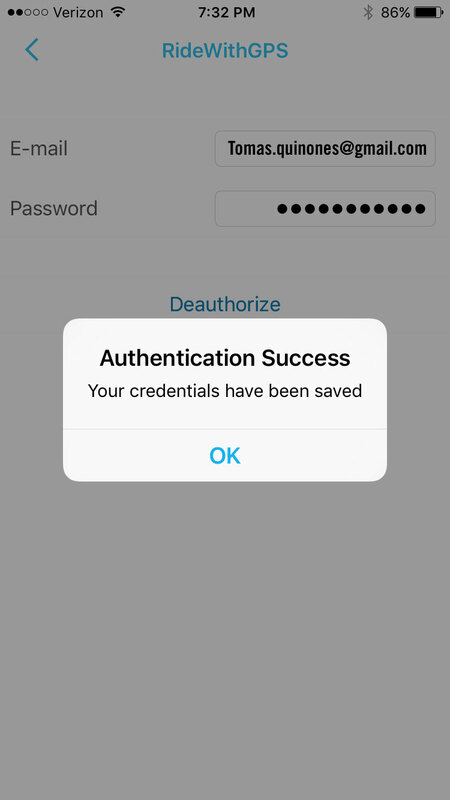 You will see a prompt informing you whether or not your authorization was correct. 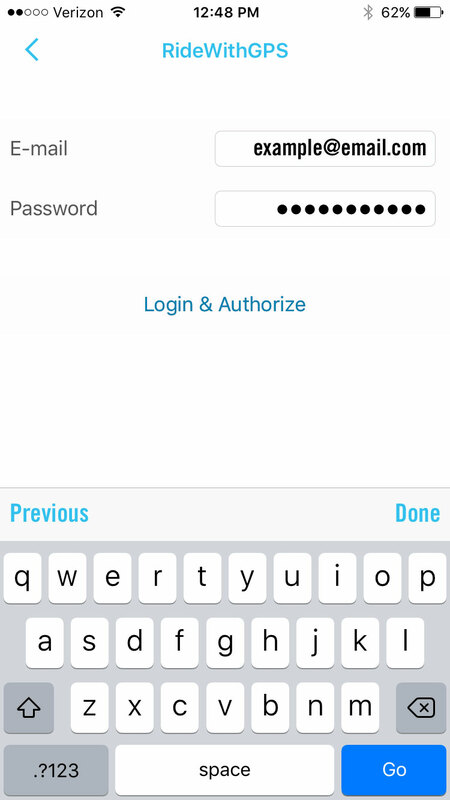 If your password is not accepted, sign in to the Ride with GPS website to check your password or set a new password if necessary. Now that you have authorized the ELEMNT to sync to your Ride with GPS account, you can sync all the routes on your Ride with GPS account to the device. Only the routes will sync to the device not the map styles or Points of Interest. 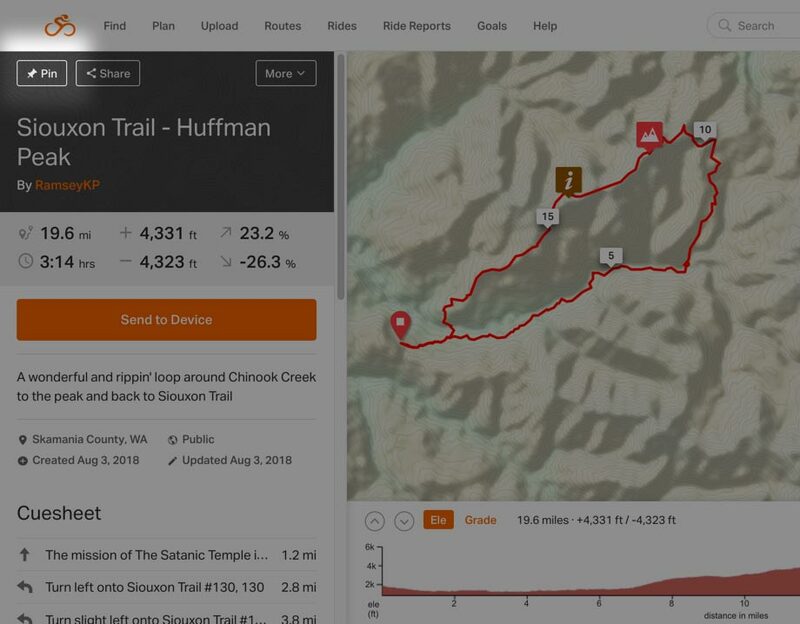 Press the page button in the lower right corner of the ELEMNT screen until you see a map, and route appears just above the lower left button. Press the left button to choose a route. Press the middle button to sync your routes. The ELEMNT will not automatically fetch any new routes you have created since the last time you have synced, so you must go through this process each time you want to find newly created routes on your account. The time to sync depends on the number of routes in your Ride with GPS route library, but generally, the process takes just a few minutes. Select a route to start navigation. Club members can pin their club routes for quick access on the ELEMNT. This can be done on the website or the app, and means club members will always have easy access to club route navigation. Click PIN in the left panel of the route. 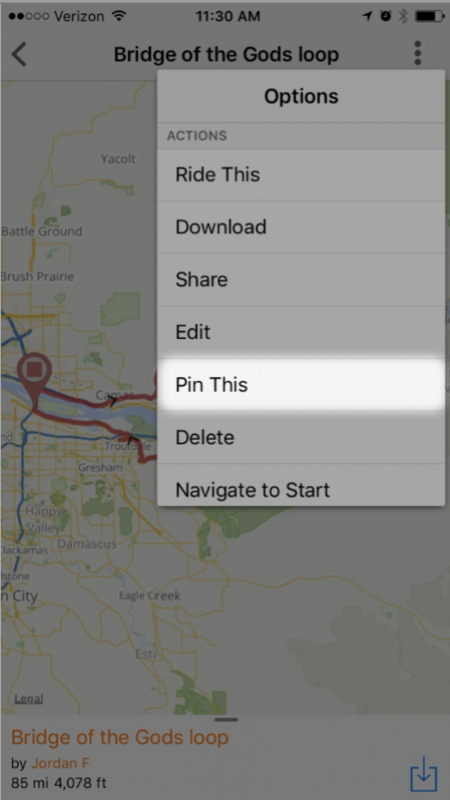 To pin a route on the Ride with GPS app, select your desired route from your route list in the app. Tap the icon in the upper left corner of the route to bring up the route options menu. Tap pin this to pin the route. Each time you pin routes, you will have to sync your ELEMNT. The ELEMNT route library does not sync with Ride with GPS automatically, so if you do not sync newly pinned routes, they will not appear. Once you have pinned routes and synced your ELEMNT, you can easily find these routes in your ELEMNT route library. Go to the routes page on the ELEMNT. Press the lower button on the right side of the device to select sort. Press the sort button to scroll through available sort criteria until you see starred. This will bring up a list of starred routes. These are your pinned routes. 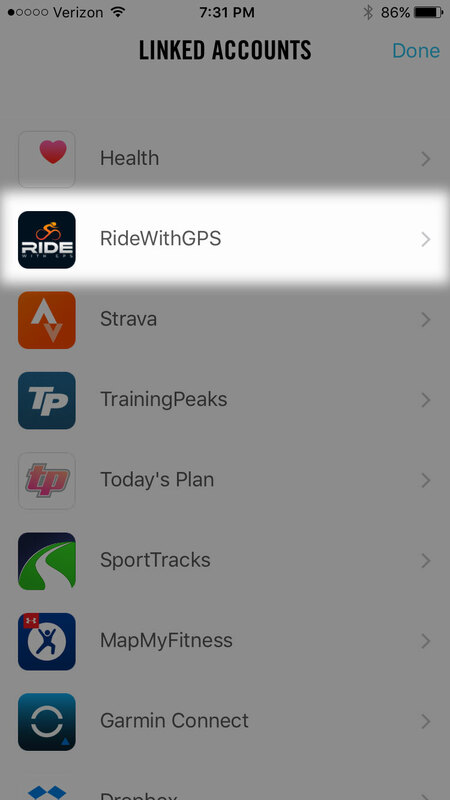 Will my saved rides sync back to Ride with GPS? As long as the app is authorized to sync to Ride wth GPS then rides recorded with the ELEMNT will sync back to your Ride with GPS account. Will these routes be available if not connected to wifi? The routes are available with or without wifi as long as they have synced to the device. The list of routes you see on the routes page have all downloaded to the device and are ready to navigate without a wifi connection. 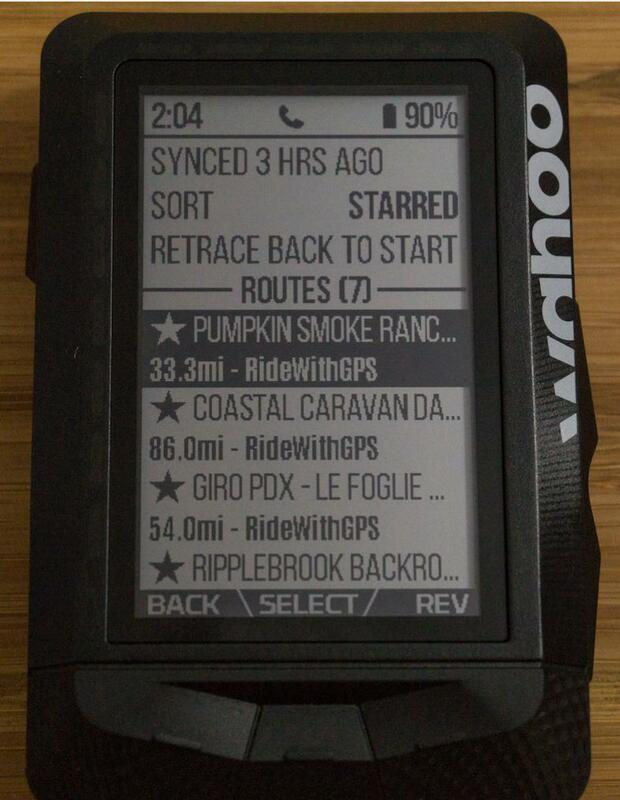 How do I get additional help with my Wahoo ELEMNT?